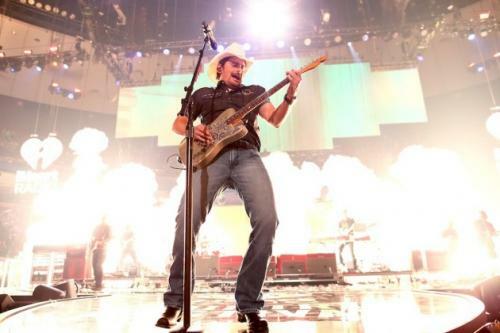 Brad Paisley‘s latest single is an ode to football, and he’s partnered with CBS Sports for some special coverage of the SEC football season. The country star references 18 different college football teams in the lyrics to “Country Nation,” and he’s been promoting the single in a lot of creative ways, including booking a string of free shows at colleges for his Country Nation College Tour, which wrapped up on Saturday (Sept. 12) at the University of Arkansas. Paisley also headed to Ft. Worth, Texas last Saturday (Sept. 5) to perform the new song on ESPN’s Colllege GameDay season opener, and he recently released an entertaining video for the track that calls upon the mascots from all different teams, who join him as he rocks out on the football field. He is joining in the SEC on CBS coverage by recording a customized version of “Country Nation” for the broadcast, along with video elements that will be part of CBS Sports’ broadcasts of Southeastern Conference football throughout the regular season. “Country Nation” is the fourth single from Paisley’s current album, Moonshine in the Trunk.